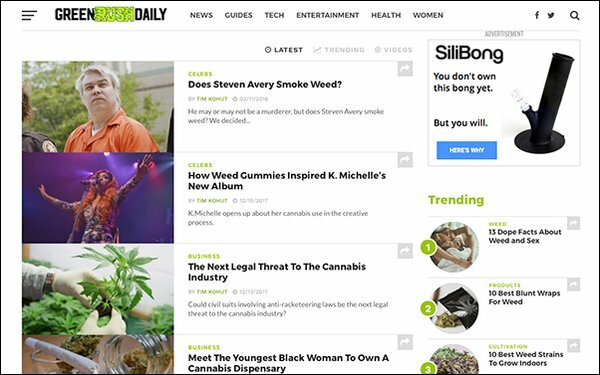 Cannabis-focused magazine publisher High Times has purchased the Green Rush Daily site for an undisclosed amount. Green Rush Daily will continue to operate independently as a media company. “Adding Green Rush Daily to the High Times family strongly enhances our editorial coverage, online presence, audience type and advertiser reach,” stated Adam Levin, CEO of High Times. “The deal will significantly benefit the advertisers and readers of both." Green Rush Daily has 4 million monthly uniques and 9.5 million monthly page views. It claims to be one of the fastest-growing cannabis media companies in the world. Founded in October 2015, the site covers cannabis-related news, culture, science, politics, business, technology, entertainment and lifestyle. In recent months, High Times has invested significantly in live events, music, lifestyle offerings and related businesses, according to the company. High Times owns a number of marijuana-focused trade shows, enthusiast events and awards festivals, as well as its marquee Cannabis Cup festival. High Times has filed paperwork with the U.S. Securities and Exchange Commission to become a publicly traded company. It hopes to finish the process by the second quarter of 2018. High Times first announced its desire to go public last fall. Cannabis-focused magazine brands are on the rise, as the legalization of marijuana for recreational use sweeps the nation. Last year, two new magazines launched for female cannabis enthusiasts: Broccoli and Gossamer. Civilized, a digital media company focused on cannabis culture for professionals, announced in May it had raised $1 million in a Series A funding round.